You know how it is, there is this new book everybody is obsessed with and keep talking about and you see it everywhere. 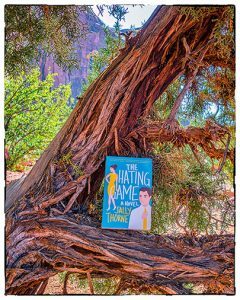 The Hating Game by Sally Thorne was one of those books I kept seeing everywhere, so I did what anyone would, read the blurb on Goodreads. But then I was like – Huh, another office romance, the hate-to-love game. Big deal! I knew I would read the book anyway because it sounded like a rom-com, and from time to time I need one of those light fluffy books. And now, I am so glad I did read this one, my only regret being – why didn’t I pick it up earlier. Josh and Lucy, the two central characters kept me thoroughly engaged from start to finish. Lucy is the ideal combination of quirky and adorable. The way her mind works is just so logical yet hilarious. I found myself laughing out loud again and again at her monologues. Josh is a perfectionist. Extremely good at his work, neat-freak, orderly and a closed book. Your perfect brooding hero, but also one who does not hesitate a bit to poke fun at Lucy. The banter between these two is seriously addicting and the humor is absolutely contagious. For a romcom, the plot is very well built and there is not a single dull moment. Oh and talking about their chemistry, it is seriously off the charts. You could literally feel the slow burn of all the sexual tension. This is like the perfect feel-good romance that’ll put a big smile on your face. All in all this is a distinctly witty and extremely entertaining read. An excellent debut novel. I look forward to reading all of Sally Thorne’s work.